The execution of Queen Anne Boleyn had been postponed from the previous day. No one really knew why, although there were some rumours, one of which was that Thomas Cromwell had wanted to make sure that no foreigners were there to witness this unprecedented event. The other story being told was that the executioner had been delayed on his journey. I don’t know if either of these stories are true. On the day of the Queen’s execution, I arrived early at the Tower of London, a few hours after dawn and found that a large crowd was already gathering in the great courtyard. 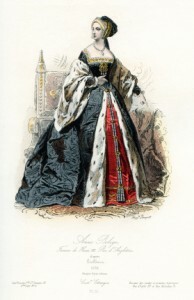 About an hour later, the Queen came out of the apartments where she had been imprisoned, accompanied by guards and by the Constable of the Tower, Sir William Kingston. Her ladies followed behind her. She looked calm and composed, and certainly not how I would imagine I would look if I were to be executed. She was wearing a black damask night robe, with a red underskirt, an ermine cape and a gable hood. She walked slowly to the scaffold, which was draped in black and strewn with straw. She then climbed the steps, assisted by Kingston. The executioner had come all the way from Calais to execute the Queen in the French manner. Neither myself or anyone around me knew which one of the men he was at first, as all the men on the scaffold were dressed in the same way. The Queen asked Kingston for a little time to speak what was on her mind, and so she stood on the scaffold and made her speech. She said that she was to die according to the law and would say nothing against it. She asked us to pray for the life of the King and also to pray for her. Her ladies helped her to remove her cape and her hood, and one of her ladies gave her a linen cap to put on. After this they bandaged her eyes, then moved back so that the executioner’s path was clear. The executioner knelt to ask her forgiveness, which she duly granted. It was now time for her to die. One of her ladies moved forward and bandaged her eyes, then moved back so that the executioner’s path was clear. As she knelt there awaiting the blow, the Queen’s lips continued to move in prayer. This continued for a few seconds, then the executioner shouted ‘Bring me my sword!’ As the Queen turned her head, the executioner brought the sword up and in a split second her head fell to the ground. The execution was now over. As we left the courtyard I turned to look at the scaffold. The Queen’s ladies were preparing her body for burial. She was to be buried in the chapel of St Peter ad Vincula along with her brother who had been executed a few days before.